Omou, the Japanese word for think, is Predominately Visual, a photo by timtak on Flickr. The Japanese words for "think" (omou) and thought (omoi) are represented above in mixed logographic and phonetic script. The question as to whether Japanese and Chinese script does in fact transmit meaning directly from the visual "graph" is hotly debated (Hansen, 1993). I strongly agree with Hansen. Characters do mean. Like Derrida's word "differance," (Derrida, 1998), designed I think to draw attention to the trace, or graph, there is a gap between the sound and the meaning in Japanese words. Derrida's word "differance" (to defer) is pronounced the same as difference (to be not the same), but means something else, as a graphic neologism on the page. Japanese words can mean different things depending upon the graph used, such as foot 足 and leg 脚, both pronounced "ashi,". Japanese is even more obviously logographic than Chinese, because in Japanese each characters can be pronounced many ways. For this and other reasons, even native speakers may be able to read the meaning of a character without being able to pronounce it. .
What is not debatable in my mind is that the act of thinking in Japan is extremely or predominantly visual. The Japanese words for thought shown above, as those in English, describe the calling to mind of both language and vision. 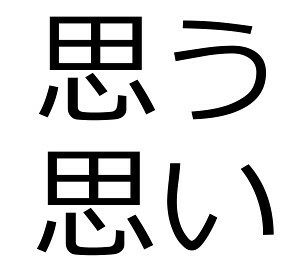 However in Japanese one can think someone, e.g. "think her" (kanojo wo omou taking a direct object) and this means at least to call an image of her to ones mind. In so many other compounds of the Japanese word to think, such as "omoi-ukaberu" (float a thought), "omoi wo haseru"(direct ones thoughts) it seems clear to me that this act entails predominately the calling to mind of images. Western thought as everyone since Plato tell us, is predominantly "the soul's discourse with itself" (Miller, 1981, see Kim, 2002).